Forjas Taurus SA, a Brazilian gunmaker is probably the only one having a better time than supporters of presidential election frontrunner Jair Bolsonaro at the moment. 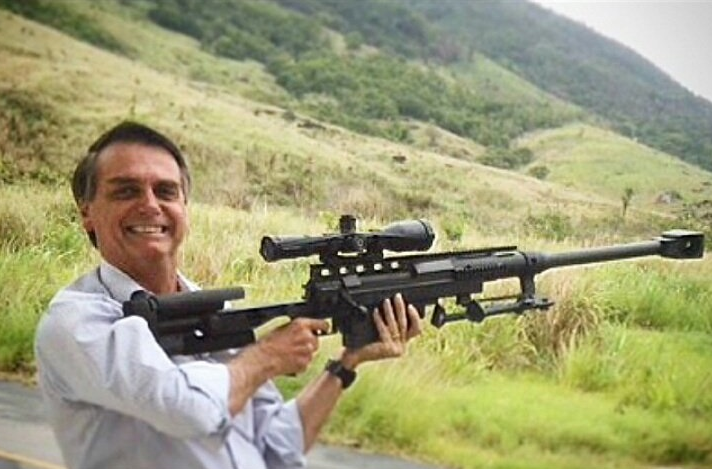 Brazil’s local firearm manufacturer has seen its shares more than triple in value since the beginning of the year, over the expectation that the rightwing conservative will win the Presidential election on 28 October and deliver on his campaign promise to liberalize gun ownership. The company’s stock is up 330 percent year-to-date and analysts expect it to go even further. The fiery rightwing former army captain expected to become Brazil’s next leader strongly favors liberating gun ownership to combat the high rates of violent crime in the major cities of the largest South American nation. In a Facebook live stream this week, Mr Bolsonaro once again reiterated that he felt gun ownership is a legitimate form of self-defense: "Why have I always defended the ownership of firearms? It’s so that you, upstanding citizens, with a few requirements, can have a weapon inside your house or your farm. If some guy breaks down the door to your house, knocks down the gate of your farm, you have the right to react." Related coverage: <a href="https://thegoldwater.com/news/39703-Brazil-Election-Haddad-PT-Claims-Steve-Bannon-Is-A-Specialist-In-Spreading-Terror-Video"> Brazil Election - Haddad (PT) Claims Steve “Bannon Is A Specialist In Spreading Terror” (Video)</a>. Ever since his strong showing in the first round, where gained 46% of the vote, the highest vote share ever recorded since Brazil returned to democracy, the benchmark Ibovespa index has gained about 12 per cent while the currency, the real, has strengthened about 10 per cent against the dollar. The latest polls have heartened investors who were earlier worried that his rival,Mr Fernando Haddad of the leftist Workers’ Party (PT), might stand a chance. As the party of former Presidents Lula, Temer and Rousseff were mostly known for its interventionism in the economy, markets viewed a return of the PT as catastrophic. He's another Trump. Thank God! Bersa not anywhere near Taurus, I have a PT92 from 1988, Taurus did a re-spring, mag release rebuild, clean and lube, all I paid for was shipping from ffl. Carry On! !